Selected, edited and with a preface by John Tremayne.The Stella Press, 2015.Printed and bound by The Fine Press Book Bindery, Finedon, Great Britain in a limited edition of 150 numbered copies. Super Octavo (197mm x 270mm), 113 pages, sewn. Typeset in Berthold Bodoni Old Face. Printed on Logan Book Wove 150gsm soft white acid-free paper made by Fedrigoni in Verona. Bound in quarter dark-blue Dubletta 3253 cloth and Tiziano Terra di Siena paper sides. Title-plate engraved by Paul Kershaw, printed in two shades of blue and set into front cover. Spine-label printed letterpress on matching Terra di Siena paper. Dark blue Merida Indigo endpapers. 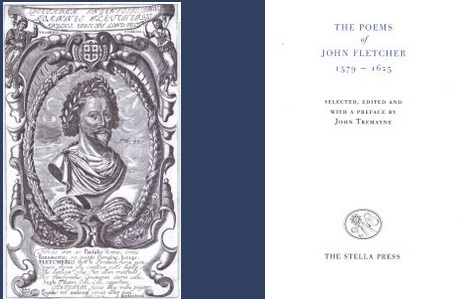 Engraved frontispiece-portrait of John Fletcher by William Marshall (1647). Price: £ 35.00, Euro 50.00. The Image of Calabria in English Literature is an 85-page large octavo book (197 x 270 mm). It has been typeset in Günter Gerhard Lange’s Whittingham, a typeface based on founts used by the Chiswick Press around 1840 and released by the Berthold type foundry in 2000. The printing and binding is by the Fine Press Bindery in Finedon, Great Britain. It is printed on superior paper (Logan Book Wove 150gsm Soft White acid-free paper made by Fedrigoni in Verona). 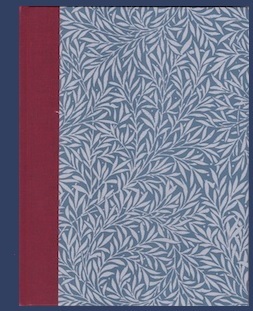 The binding is in quarter maroon Dubletta cloth with blue William Morris willow-bough patterned boards. The book is sewn. 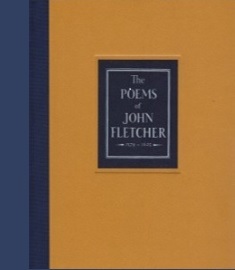 It is printed in an edition limited to fifty numbered copies. John Hayward: Elizabethan Historian 1564? – 1627. On the History of the English Nation and other Prose. Edited and with an introduction by Peter Spring. This selection of Hayward’s prose in a number of genres – historiographical, political, military, biographical, confessional – is based on the first editions, and complemented with a checklist of John Hayward’s publications. The first civil historian in England to write preferentially and exclusively in English, Hayward may not have founded the tradition of vernacular history in England, but he more than anyone helped to consolidate the use of the vernacular in historical studies and thus champion the transition from medieval chronicle to Renaissance ars historica. The book in super-octavo format runs to 174 pages. It is typeset in Miller, a digital typeface designed by Matthew Carter in 1997, printed in the U.K. on Corolla Book Laid 140gsm paper made by Fedrigoni in Verona, sewn and bound in quarter cloth with marbled sides at the Fine Book Bindery. The edition is limited to 50 numbered copies. Edited with a Preface by Peter Spring. 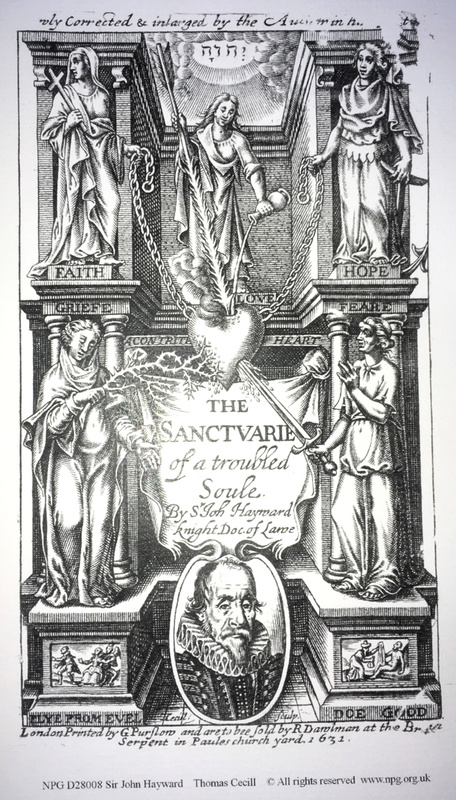 A letterpress edition of the twelve-stanza poem that Robert Burton prefixed to his magnum opus, The Anatomy of Melancholy, first published in 1621, enlarged in successive editions between then and 1651. Usually printed as a single block of verse, as it is in Burton’s folio editions, herethe twelve stanzas are separated and superscripted with Roman numerals. Alternating between the blessings and ills of melancholy, the poem presents not two different and incompatible attitudes to life, but two antithetical moods that contend with each other in the same person and were distinctly present in the author’s own nature. The poem is followed by an Appendix with Anthony Wood’s Life of Robert Burton. The poem is typeset in Romanée 16 pt, a serif typeface of austere but striking clarity designed by Jan van Krimpen in 1928 (roman) and 1949 (italic), the title-page in the same typographer’s Open Kapitalen fount. In super-octavo format, it is printed on W.S. Hodgkinson 150gsm handmade wove paper, sewn, and bound in quarter cloth with terracotta end-papers and marbled paper sides made by Jemma Lewis. There is an elegant printed paper spine label. Printed letterpress in the U.K. in a limited edition of 50 numbered copies.